YouTube/Sainsbury’sThe Sainsbury’s Christmas ad presses all the right buttons. Every year in the UK, department store John Lewis arguably wins the festive ad season, with a cute tale about a lonely struggle to brighten the Christmas of another person, backed by a lilting ballad. But this year the UK’s third biggest supermarket, Sainsbury’s, is eating John Lewis’ Christmas lunch. Sainsbury’s epic 2014 Christmas commercial (watch the full ad below), created by ad agency AMV BBDO, isn’t a fictional tale of a cute CGI animal, or even a fictional family eating Sainsbury’s turkey dinner and sharing Sainsbury’s gifts. 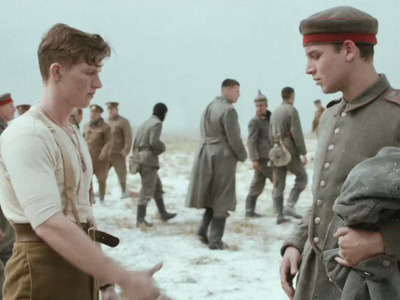 The ad depicts the remarkable true story of real events that took place on Christmas Day in 1914, during World War I. On that day soldiers on both sides of the conflict downed their weapons, emerged from their trenches and exchanged seasonal songs and even gifts. The two armies also played a friendly games of football to mark the festive occasion, a warming image also featured in the ad. This year’s ad from Sainsbury’s is, in our opinion, the best Christmas effort from UK shores. It doesn’t follow the same trite formula that — while still effective (we absolutely loved this year’s John Lewis penguin spot) — many viewers have come to expect as soon as festive ads start appearing on screens in November; it’s not a hugely commercialized affair; and the cinematography is stunning — it won’t look out of place in the cinema. Hats off to you Sainsbury’s and AMV BBDO, you’ve produced an absolute stunner.